Beyond Codes ~ Transformed Design Philosophy & Professional Discipline ! The creative, person-centred and ethical Fire Engineering response, in resilient built form and smart systems, to the concept of Sustainable Human and Social Development … the many aspects of which must receive balanced and synchronous consideration. The aim of Sustainable Fire Engineering is to dramatically reduce direct and indirect fire losses in the human environment … to protect the natural environment … and, within buildings, to ensure that there is an effective level of fire safety for all, not just for some ! Building codes do not protect vulnerable building users in fire emergencies, e.g. People With Activity Limitations (2001 WHO ICF), i.e. 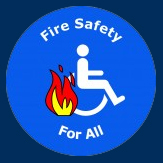 frail older people, people with health conditions/disabilities, young children (under 5’s), women in the later stages of pregnancy, etc … or Firefighters. Fire regularly causes enormous environmental devastation and social disruption. It is also a significant drag on GDP in all economies, because of the damaging impacts on human health, flora, fauna, soil, air, water, business continuity and branding. Post-fire refurbishment works are very costly ! from 29-30 September, to explore Sustainable Fire Engineering ! Special Fire Safety Measures are required in Residential Buildings ! c) protection of property, only insofar as it is relevant to a) and b) above. More cannot reasonably be expected from Building Codes & Standards. For these fire safety objectives to be effectively attained … a system of stringent, independent Technical Control must operate. Self-regulation is No regulation ! the Building Codes and Standards towards which he/she is directing compliance … and to clearly explain that scope, and those limits, to their client/client organization … and to the other members of the Project Design Team. Code of Ethics (PDF File, 112Kb), supported by an overt emphasis on Continuing Professional Development. Safe, Resilient and Sustainable Built Environment for All. written in a simple, generic language in order to be equally accessible to diverse design disciplines and interested groups. This will be the third Reflection Document issued within CIB Working Commission 14: ‘Fire Safety’. The first, back in April 2012, dealt with the subject of ‘Structural Reliability & Fire-Induced Progressive Damage’ ; the second, issued in October 2015, explored Buildings & ‘Fire Incident Human Behaviour, Abilities & Perception’. references to the SFE Priority Themes … and a necessary Generic SFE Terminology. 2. Strategy for Future SFE Development – identify full range of stakeholders and barriers to future progress. application beyond original ‘high-risk’ building types suggested by NIST. This is an essential prerequisite for a Reliability-Based SFE ! 5. Practical & Resilient Implementation of SFE Research Agenda. Sustainable Buildings: How can a creative response to these strange and wonderful new building types be encouraged and widely promoted within the International Fire Engineering Community ? waiting to get started ! Would you like to get involved ?? After SFE 2016 DUBLIN … a Sustainable Fire Engineering Network will be established.